A view from the cycle path: Is it all about the price of gas ? I agree with your point that there needs to be more than just high gas prices to get people on bikes. however, when prices were are their highest ever last summer people were buying bikes, fixing old bikes, and riding more. from where this guy sits, i think cities in the US and Canada need to see more cyclists on the roads before they will spend on bicycle infrastructure - and high gas prices seem to help make that happen. It isn't all about the price of gas. But the price of gas is a good way to get people started thinking about alternatives to driving. I'm in Minnesota. I don't know any consistent cyclists who cite the price of gas as the primary motivation for biking. However, when talking to non-cyclists, it is one of the things that will actually get them thinking a bit about cycling. I doubt they ever will without good cycling infrastructure, but the thought of leaving their car also has to be necessary. Yep, live by the gas price, die by the gas price. Got to have more of plan than waiting for peak oil. It's typical in the US to talk about 'Europe'. There is some validity to the idea. Most probably on a whole, cycling across Europe is more common as a mode of daily transportation, and gas prices, for sure, are much higher than the US across the continent and the UK. Looked at country by country, yes the differences are big. Spain, in spite of having more moderate weather for the most part, is among the lowest users of bicycles. Most UK motorists have factored in the high price of petrol and further rises don't hit them quite so hard. I think cutting parking spaces and making it less convenient to drive is much more effective because the car is the ultimate convenience. Look at how cycling rates in London have shot up in recent years - despite it feeling very scary even for an experienced cyclist - because all the other transport options are at or beyond capacity. I'm not sure whether other European cities or American cities do this, however here in Ontario,Canada almost daily the TV & Radio media give a "gas price update" trying to give people location to the cheapest gas. The biggest reason I hear why NOT to spend on cycling infrastructure here in Canada, is the winter weather & distance. A small amount of people live in the country. (I think something like 90% live within larger urban areas or close to the USA border). People think that because they live in a city of 200,000 or less, or if it doesn't have a WalMart it doesn't deserve proper bicycle lane-ways and that only cities like Toronto, Montréal & Vancouver should have them. I'm always amazed at a city such as Houten. With such a small population, from what I see they have world class bike-ways. In credit to the Province of Québec, they have what's called "La route verte/The Green route", which connects nearly the entire province. Linking cities, towns and resorts with one another with off road bike "highways". Only draw back, is Québec gets some nasty winters, and I don't think there cleared. But spring, summer & fall it's a top notch bike-way. National Geographic ranked it number one in the world. Townmouse, Sean, Gregg: I think it's important not to confuse small rises in cycling by people under pressure with genuine progress. The cycling rate in London actually rose from "very small" to "just a bit bigger". It's still the preserve of enthusiasts and people who have to ride bikes. It isn't enough for people to have to cycle "because all the other transport options are at or beyond capacity" or "despite it feeling very scary even for an experienced cyclist." Neither of these things grows a true culture of everyday cycling for everyone. Rather, those forced to ride bikes will give it up as soon as they can. Over here the car is not "the ultimate convenience." That it is so in the UK is due to the policies that the country has followed over time. NL used to follow similar policies and once had more cars per person than the UK. However, it's some years since that was the case. Convenience here comes with riding a bike. Miguel: We unfortunately don't have your climate. It is colder in the winter and rains more here than anywhere I lived in the UK, and the headwinds are amazingly strong due to the lack of hills. Nevertheless, there is more cycling than anywhere else simply because it's been made into a very pleasant thing to do. Ryan: Houten is a great place, but that's not all. Every town here has such design. It's not just towns, either. The countryside between them also provides for cycling, both with direct commuter routes and recreational routes. 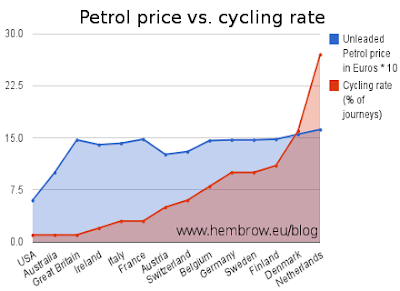 Low fuel price isn't a reason - it's an excuse, just like all the others (can't afford a bike / there are no showers at work / no-where to leave a bike / don't want to wear geeky clothes / a helmet'll mess my hair up / it's too far / what if I get a puncture / a car is safer / it doesn't look professional / etc). Different societies favour different excuses. In the Netherlands, the government bit the bullet, and dealt with as many of the excuses as it could, making riding a bike a pleasant, convenient and safe way to get around. The results speak for themselves. David - too true, and I don't want to diminish the importance of proper cycling infrastructure, but I think examples like London do show that you can apply a bit of stick as well as a lot of carrot to get people onto bikes. Also - having said that cycling in London is scary (which it is) I would add that once I'd switched from the bus to the bike nothing - not the worst weather or the worst drivers - would have got me back onto the bus again. (I'd never commute by car anyway). I quite agree that high gas prices are not enough. Here in Ontario last spring and summer, petrol prices almost doubled from about 70 cents per litre to $1.35. The result? A not-so-whopping 5% drop in the quantity of gas used. Since last summer, gas prices have almost dropped in half, to $0.85 per litre. The result? Almost no change in the amount used. The experience in the USA was similar. Last spring and summer, petrol prices doubled, and vehicle miles travelled dropped about 5%. Big deal. Even in the Netherlands, epicentre of bicycle culture and high gas taxes, the same thing happened. Dutch petrol prices went to almost $2.00 per litre last year, and petrol sales dropped... not much. Dutch motorists did not leap onto their bicycles and use their wonderful cycle infrastructure. What did change in both Ontario and the USA was a 40-60% drop in SUV sales. Doubling the petrol price did not affect car culture, but it did affect SUV culture. Since the Detroit automakers were making their profits off those vehicles, they are only now avoiding bankruptcy with a huge government bailout. This is an issue of the elasticity of demand of gasoline. At some price point, of course, gasoline becomes unaffordable and there will be a serious reduction in car use. But my estimate is that this will not happen even at a price of $5.00 per litre. Why? The average private car in Ontario gets driven about 15,000 km per year. Since a moderately efficient car can get at least 8L/100 km, this is 1,200L of gasoline. At $5.00 per litre this comes to an annual cost of $6,000. $6K per year is affordable by the ordinary person here, so I predict that he will pay it. Other things will be given up before the car will be given up. The same logic applies in the USA. So I predict that a gasoline price of $20 per gallon in the USA will still not be enough to end US car culture. As a curiosity question what are the average miles driven in the NL or the UK? I know in the US is around 15,000 miles (24,000km) I suspect the annual average to be lower which would make some difference. We have huge distances between locations with little to no mass transit. I attempt to utilize any form of transit EXCEPT a personal vehicle, however it can be impossible in many cases if you have to travel more than 20 miles(35km). 2whls3spds: According to this car rescue company, the average number of miles driven per year in the UK is just short of 10000 (16000 km). i.e. total distance is about 2/3 that of the US. A quarter of UK motorists do 15000 or mile miles, the same as the average in the US. British people make nearly a quarter of all their journeys by foot - a much higher figure than the US, so you'll find average trip distances by car are closer to the US figure than 2/3rds. I would expect the average distance driven in NL to be lower in large part because people here are so much more likely to leave their cars at home and use alternatives - rather than because trip distances are shorter. Even in the US, a vast proportion of journeys currently made by car are over distances which could very easily be cycled. It's very easy to generalise and claim that Americans have longer journeys to make. On average, they don't (or at least they don't by very much). It's just that some live in remote places and have very long journeys to make. You could also note that in more remote areas of the UK such as the North of Scotland some people live 30 miles or more from their "local" shops. There is very little public transport there, too. Dutch people often do quite long commutes by bike. I'm very far from alone on the 62 km round trip commute that I do a couple of times a week at the moment. Interesting. Let's assume the average car in the UK travels 16,000 km per year, petrol prices are 91.4 pence/L and the car has 8L/100 km efficiency. Then the annual petrol cost is 1,170pounds sterling. Easily affordable. I predict that if the petrol price were to triple, UK car culture is so deeply entrenched that most motorists would choose to pay 3,500 pounds sterling rather than give up their car. Kevin: I think you are absolutely right. Nothing will change in people's attitudes until they can be convinced that they want to cycle. It's especially stupid when cyclists get behind efforts to tax motorists more. It simply fosters a "them and us" attitude, and if anything reduces the likelihood that motorists will want to cycle. Interesting I would have figured their would be a bit larger gap in annual mileage. I honestly believe one of the largest stumbling blocks to cycling in the US is the lack of safe routes, lack of alternatives, like parallel streets, mass transit and general cycling facilities. Too many subdivisions in the US are built on the "lollipop" design where there is only one way in and one way out, and it dumps on to a multi lane high speed road. The other thing that needs to be addressed in the US is the total lack of proper drivers' education, semi-annual re-certification. The laws pertaining to cyclist/motorist interaction as well as responsibility need to be revamped. Yes their are plenty of short trips and many of them can be, and in many areas are being done by bicycle. As the numbers increase we hopefully will see and increase in acceptance of people riding bikes as well as an increase infrastructure. It is already happening in places like Portland and NYC. Aaron, the "Lollipop" design that you refer to is quite common in the UK too - and has just the same effect. I took photos in a new housing estate in Cambridge a few years back which is built along these lines. Completely awful for cycling. Steve Melia in the UK wrote about a few years ago how the UK has imported US style planning and incorporated it in the designs of new developments. Luckily, the Dutch don't design in this way. There is always more permeability for cyclists and pedestrians than there is for drivers. Where developments were planned on the US/UK model they now have been redesigned. As for driver education. I took my driving test in the UK, but from what I've heard there is indeed more said about the rights of cyclists in the Dutch driver education, and of course there is the liability law which expects heavy vehicles to avoid colliding with lighter vehicles.